I arrived in the small island of San Pietro by ferry in a windy afternoon of the month of June. San Pietro (St. Peter) is a small island on the southwestern coast of Sardinia (Italy) and its main road, crossing the island fron north to south, is 12 kilometers long, less then 10 miles ! ! The eastern coast is lined by white sandy beaches, while the western coast is a continuous rocky cliff, and is on one of these rocks that the Capo Sandalo Lighthouse stands. The next day I met Bruno Colaci, the lighthouse keeper, a 58 years old hearthy and austere man, a modern hermit, one of those men who can still lead a secluded and silent life even in the age of chaos. Bruno took me inside the light and I was so excited ! For me it was the first time into a lighthouse. It is not easy to get into one. All the lighthouses in Italy are owned by the Navy and are not normally opened to the public. While we were climbing the 124 steps of the stair inside the tower Bruno told me his story. He is nearly born in a lighthouse, he entered his fist one when he was four. His father, a former seamen during WWII, got the new job as a lighthouse keeper when he left the service in 1945. Then the little boy started to go around Italy into the different lighthouses where his father was sent, many on the mainland, but some in remote small islands where sometimes, during the storms, they had to wait even 15 days before to receive help and food. When Bruno reached the age to go to school sometimes, when on the mainland, he had to walk from five to six kilometers every day to go to school. When he grew up, Bruno started to look for a job, different from that of his father, but the only one he could find was as a lighthouse keeper. Bruno though that this was his destiny and accepted it. 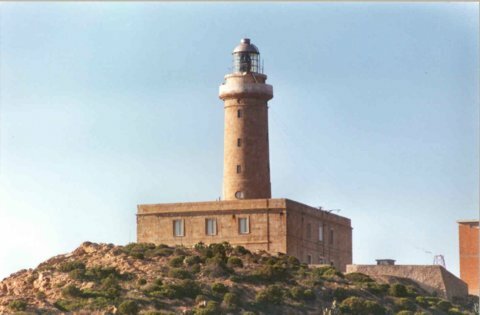 Now, after so many years, he is happy of his decision and, like his father, he has been running around Italy in different lighthouses until he reached, in 1972, the Capo Sandalo Lighthouse, where he lives since then. When we reach the lantern room Bruno shows me proudly the Fresnel lens and the 1000 Watt halogen bulb that he handle kindly, like if it was a precious air-blown Murano glass. He loves this lighthouse like a person of his family and takes care of it like of a child. Even if the lighthouse was built in 1864 and shows the signs of the passing time, it is a beautiful building, standing on the top of a precipice leaning on the sea, where it lights the route of the big ships going from North Africa to Gibraltar. I ask if he does not feel too alone in this corner of the world, on a windy rock, and he answers that he is happy here, in this small paradise. He speaks slowly, a few words, then a long silence, intermittent words like the light of his lantern He says that a person become like this living in a lighthouse, he is never in a hurry. Bruno has a family that he loves deeply, but they live in the nearby town of Carloforte. The children have to go to school and he likes that they feel more comfortable of what he was then he was a child. He does not feel alone, he goes to see them every time he can and during the summer his wife and the children join him in the lighthouse. San Pietro is a small island on the southwest coast of Sardegna. You can access the island by ferries out of Portoscuso or Sant'Antioco.